I had been toying with the idea for a long time. I wanted to create a recording showing that the vibes can have a big warm sound and that it is possible to play 'beautiful music' on the instrument. The vibes is an instrument which lends itself for virtuoso music. Examples enough, Lionel Hampton, Terry Gibbs...but how about the melancholy side of the instrument, has that ever been fully explored? A chamber ensemble seemed to me to be the best setting for realizing the sound I had in mind. 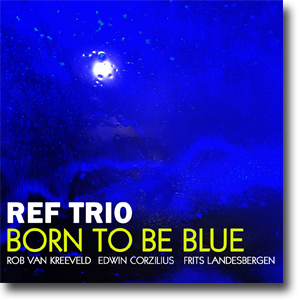 I contacted master pianist Rob van Kreeveld and long time friend and superb bassist Edwin Corzilius to help me with the project. It turned out to be a dream team. The music came to us so easily. The ballads and waltzes turned out exactly as how I had pictured it; warm and relaxed, keeping the song central. As a musician one always has wishes. One hopes to get to play in certain places, or play with one’s musical heroes... I have been most fortunate in my career, as many of the things I wished for when I was young, actually did happen. And now this new "mature" wish has been made possible by Peter Bjørnild and Frans de Rond, two producers with an incredible big hart for music and sound. Thank you Rob, Edwin, Peter and Frans, I am so very happy with the result, I believe we have created some beautiful music. When creating the sound stage, Frans spent a great deal of time getting the balance of the REF Trio as optimal as possible using the ambient microphone stereo pair placed in the 'sweet spot' in Studio 2, before adding the spot microphones. We wanted to create a sound field that was intimate but also had enough depth to reflect a visual representation of the instruments. We wanted the melodic part of each instrument to stand out without overshadowing the whole. Thus the piano and the vibes have been given a position in the sound field, instead of the more common, radio friendly approach, with the instruments piled on top of each other with no placement. The benefit of this approach is that you can actually see the trio in front of you between the speakers. In a sense we are old fashioned, maybe we listened to too many old jazz recordings, but on the other hand.......this is what we believe a high-resolution recording should be about.